From browsing this site, I have learned that US national parks and wilderness areas have restrictions and that campsites need reservations, sometimes months in advance. I've never seen anything like it in Europe; in popular areas, there are simply many campsites and one meets hundreds of people per day (in extreme cases hundreds per hour) on the hiking trails, whereas in remote regions, there are no campsites and one meets nobody (in fact, one usually meets less than 10 people/day once more than two hours from the parking place). It's supply and demand. I haven't seen a full camp-site since 1994, and I've been camping every year. North America has a lot of sparsely populated areas, probably more than Europe. This makes me wonder — how crowded do those hiking trails get? For example, suppose that one has obtained a permit for hiking + camping in the wild in Yosemite National Park. Since this is subject to a quota (correct me if I'm wrong), the total number of people hiking at a given moment should be pretty easy to know. How many people should one expect to meet under such circumstances, order of magnitude? 1 per day? 10? 100? Are quota set so that every hiker can have the opportunity to feel alone in the world, or so that hikers won't completely overrun the national park and destroy it? 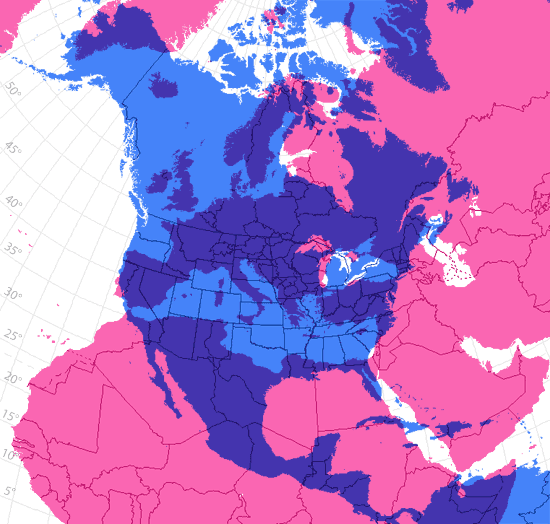 Where does the difference between Europe and North America come from? Is nature in North America more sensitive than in Europe, is the demand for hiking much higher, or do hikers in North America concentrate even more in a few small areas than in Europe? I'm not sure you can generalize US Hiking trails, since there will be vast variability in popularity, usage, land area, population density etc. (Just as you mentioned is the case in popular vs. remote areas of Europe). Yes, there are some areas that require reservations, but most don't. In fact, I feel comfortable saying MOST federal public land in the western US have no quotas, no reservation system, no anything. In many of those, you won't see another soul for days. Other areas might be equally unregulated and have wall-to-wall people. In the answers here: "When do I need a permit to go into nature?" I list some of the agencies that have different approaches to land management, and point out it varies so widely that any generalization is impossible. To answer this: "Are quota set so that every hiker can have the opportunity to feel alone in the world, or so that hikers won't completely overrun the national park and destroy it?" Yes: Wilderness areas (congressionally designated Wilderness with a capital "W" -- see below) have a legal mandate to limit users so your encounter rates are small. How that is interpreted varies by the agency administering the area (some shoot for less than 2 groups encountered per day). By contrast, some popular areas of National Forests or Parks might limit usage based on the maximum visitation possible before total annihilation of the resource. This is an awesome legacy for the US. Not all public land is Wilderness, but significant chunks are, and these are some of the most amazing natural areas in the US. As far as the US are concerned, you are talking about the most popular national parks here: places like Yosemite, Yellowstone and Zion get few millions of visitors each year, from all over the world. At the same time, there are huge stretches of beautiful wilderness, often right next to these parks, where you can hike for days without meeting anybody. In the US, there are still large stretches of land that are very well preserved, where the nature is pretty much undisturbed. These areas indeed are pretty sensitive, a large influx of visitors in these places can cause a lot of damage. In Europe, lot of the area had been very densely populated for quite a while, and most of the land has been in some sort of use for a long time. At places like that, large crowds will not really cause that much damage. Western Europe has only few very small areas that still have fairly undisturbed original wilderness, and many of those cannot be entered without a special permit that is only available to those that have some sort of business there (researchers, forest service etc. ), and the public is not allowed in at all. Because these areas are so small and there is so few of them, lot of people are not even aware that these exist. Probably because it is so densely populated, lot of Europe has numerous hiking opportunities on what's basically agricultural land: fields, pastures, agricultural forests. There are lot of hiking trails that go through agricultural land, simply because there are so few other options. In US, most agricultural land is private, and closed to public. You can only hike on state or federal lands, and in many regions these are sparse, so they get a lot of exposure, and therefore need to be protected. In Eastern Europe, there are number of areas that are still pristine, and relatively unregulated, but I believe that is going to change. Some 30 years ago, Romanian Fagarash was a place you could backpack for several weeks without meeting a single person. I have not been there lately, but what I hear from friends is that the place is becoming rather crowded, and, correspondingly, quite damaged. I expect that at some point of time Romanian government will start to regulate the visitors, perhaps by restricting camping opportunities. Camping restrictions and permits to enter particular areas are actually very rare when you look at the total land area. I believe in every case these are done only to prevent degradation caused by excessive use. By definition, these systems are therefore in place in popular areas, which is why you hear about them way out of proportion to their actual size and numbers. I have gotten a permit and gone backpacking in the north part of Yosemite National Park. That is a very popular area, and I can see how it would be damaged if everyone could just go there without the numbers being limited. However, there is no limit on adjacent land in the national forest, mostly because the demand isn't there and limiting the numbers not necessary. There are partial restrictions in the White Mountain National Forest of New Hampshire. These are different due to the different circumstances, patterns of demand, and level of damage overuse can cause. There are no permits and restriction of individuals, and some of the popular trails can get quite crowded. There are restrictions on the size of groups and where you are allowed to camp in the back country. Some of these restrictions move around as damage from overuse shifts. The general rule is to stay 1/4 mile from fixed installations like huts and purpose-built campsites, but also around what would otherwise be popular and overrun areas. For example, you are not allowed to camp near the top of Thoreau Falls. That was done because too may people did and the area became heavily damaged. All that was left was bare ground and large trees. Everything else got trampled. The place looked unreal. On the other hand, there is no restriction on total numbers of people on the trails. Some of the trails are heavily used and heavily worn, but since that stays local to the trail there is no widespread damage and no attempt to limit numbers. Last summer I did a 10 mile or so day hike that looped over a part of Franconia Ridge that is also the Appalachian Trail. We probably encountered at least 100 people on that hike, and that's not counting the people around Greenleaf Hut, which was on our loop. There are also many parts of the US that are open to the public where you can hike all day and are unlikely to run into a single person. I have done exactly that in various places in Arizona, for example, in both the desert and the mountains. What makes that possible is the huge amount of public land there. Europeans seem to have a hard time grasping just how vast some of these open spaces are, probably because there is nothing like them in Europe. There are no restictions there because there is no need for them. All the people that want to go there do, and the damage is minimal, so no need to regulate. Take a look at a map of Arizona and New Mexico. Add up the land area of the abutting Coconino, Tonto, Apache, Sitgreaves, and Gila National forests alone, and compare that to the size of a few smaller European countries. Now consider that except for a few towns that are "holes" in the forest, nobody actually lives there premanently. So in summary, restrictions on camping locations and numbers of people are only done grudgingly as a necessity to protect the resource so that others can enjoy it in perpetuity. Such restrictions are actually quite rare, limited to particularly popular areas. There are vast less popular places where anyone is welcome to hike around and camp with little restriction. To put the vastness of these areas in perspective, the total land area of the contiguous patch of national forest formed by the Coconino, Apache-Sitgreaves, Gila, and Tonto National Forests is 15.7k square miles. That just about the size of Switzerland, which is 15.9k square miles. That doesn't include other nearby public lands, such as the Prescott, Cibola, and Coronado National Forests, for another 7.3k sqm. There are more smaller national forests and wilderness areas on BLM land scattered about Arizona, and the Grand Canyon National park and lots more north into Utah. Ryan mentioned Utah. Putting that into a European perspective, it's about the size of Great Britain (Utah 84.9 ksqm, GB 88.7 ksqm) but Utah only has a population of 2.8 Mpeople. In contrast, England alone has 53 Mpeople. And most of Utah's people are concetrated in a metropolitan strip along the eastern edges of the Great Salt Lake and Utah Lake. That leaves very few people living in the large remaining wild areas. Yellowstone National Park may get 3M visitors per year, but consider it's 1/3 the size of Belgium. The entire national forest system is larger than France, Belgium, and The Netherlands combined. And that doesn't include the national parks, like Yellostone, Yosemite, the Grand Canyon, and many others. 2.7M more people live in London than Utah and Nevada combined, which have a total land area over twice that of Great Britain. The point is that it's very easy to get a totally wrong impression of wild places in the US because the few well known popular spots are not representative, and by necessity of their popularity must be managed differently. Europeans also don't seem to get the vastness of the place until they've been here. Spend a day driving accross Nevada on Route 50 and realize it takes more than one tank of gas to get between two places anyone would call a city. Or spend some time in a wilderness area in the Arizona desert and realize you haven't seen a single person in the two days since you left the last paved road. There are many wild, beautiful, and vast places that are open to anyone who wants to come. In fact, that is the case for most of the public lands in the United States. In general, wild areas here are more wild, less crowded, and less restricted than those in Europe. There are also a great many more of them. Come and visit some time. Living in Utah in the US I have a somewhat unique perspective (Utah has more national parks then any other state) I have visited all of the national parks here and most throughout the west. As others have mentioned if you compare the amount of reservations and restrictions to the amount of space the ratio is actually quite small. I thought I would answer though to give more specific examples. You mentioned Yosemite (beautiful by the way highly recommend), there is a 'Rim' trail there that leads to one of the biggest waterfalls (and biggest attractions) in the park. However the trail was set up in such a way that most (if not all) visitors hike for a mile or so to hit the falls, which means there are hundreds (sometimes thousands) of people there at any one time. For those that really enjoy hiking, you can hike in along the rim, a very strenuousness 10 mile hike with lots of steep grades. Your destination is the same, and at the end you will run into the hundreds of people. But along the way you will see a dozen waterfall's everyone else won't see and for hours you won't run into a single other person. That's one specific example but from my experience many very popular hiking destinations in US National parks are set up in this same manner. They allow the masses to see the really spectacular, while limiting the exposure of the land to those masses. And at the same time allow those who really want to, to experience both the spectacular, and the beauty/isolation of real wilderness area. Finally an example of something mentioned above, many restrictions have to do with managing emergency situations. My favorite hike in Zion's national park is very hard to get into. It requires a back-country pass and they are often reserved a year in advance. But I would never think of going into the hike without a pass. Not only would I be fined a huge penalty if caught, but I have been on the hike when a storm hits (the hike involves 8 miles of hiking in a slot canyon) and barely made it out. The last group of the day wasn't so lucky and they got trapped on the hike overnight (actually they were very lucky they didn't all die, the flash floods were horrible). If people had been in there illegally, most likely they would have died, as is, because of the limits, the rangers knew who to look for and where, and were able to manage the situation and get everyone out alive. Not the answer you're looking for? Browse other questions tagged hiking united-states europe or ask your own question. Is a type of Walking Trailer a good alternative to a heavy backpack in some cold climbing situations? Is backcountry hiking in northwestern Russia safe? What's the difference between defined Forest areas and laws with respect to hiking/camping through them in India? Is there a standard hiking trail difficulty rating system in the United States?